The key aspect of amides is that a lone pair of electrons on the nitrogen can conjugate with the C=O carbonyl only if the lone pair orbital is parallel to the C-O π-system. We can define this with the O=C-N-R torsion angle (and equate 0 or 180° with the p-orbitals being parallel). In the above definition, each R can be either 4-coordinate C (to avoid alternative conjugations) or H and the C-N bond is specified as being cyclic. As usual the R-factor is < 5%, no errors, no disorder. First, the C-N torsion, which adopts values of either 0 or 180°. Notice that whilst the anti R-group shows no more than about 20° deviation from 180°, it does have a small tail tending towards longer C-N distances of >1.4Å. The hotspot is for the syn R-group. 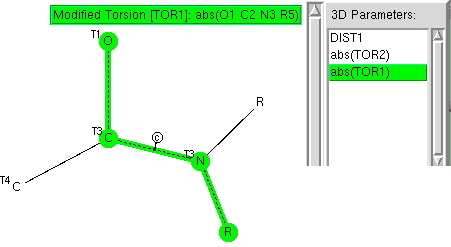 Here there is a strong trend that as the dihedral deviates from 0° the C-N bond very clearly elongates. 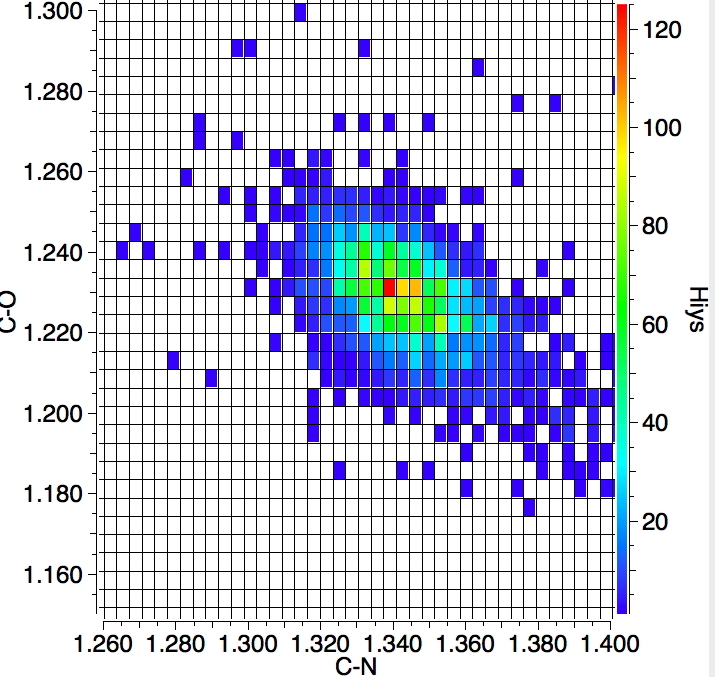 As the π-π overlap decreases, the bond elongates from the hot spot value of ~1.34Å to 1.41Å at 50°. The greater propensity of the syn-R to twist may be because it incurs more steric hindrance or perhaps because we have defined the C-N bond to be part of a cycle. 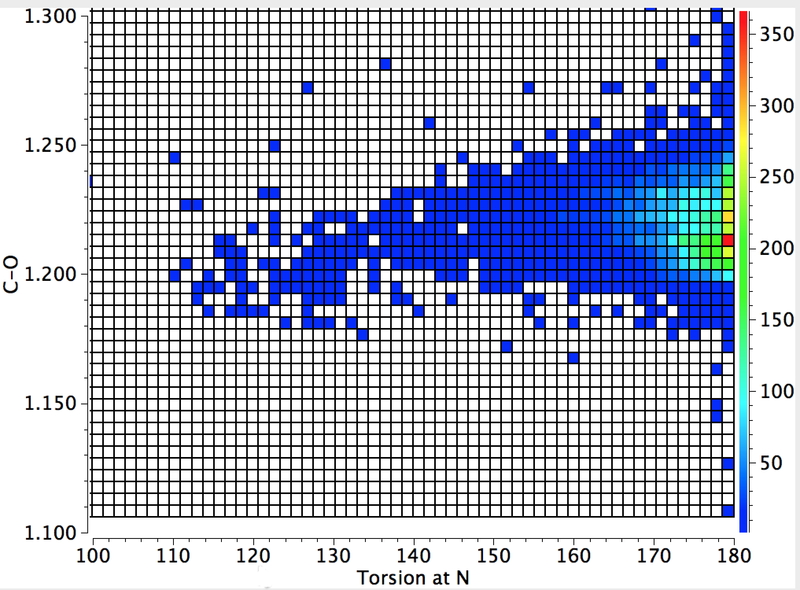 Next, we plot the C-N distance against the torsion R-N-C-R', which defines how planar the nitrogen is. A value of 180° is planar and the hot-spot is here. But as the planarity decreases down to almost tetrahedral (110°) the C-N bond elongates to 1.41Å. Notice one rather intriguing aspect; from 180° to 160° or so, there is little response from the C-N bond, but the elongation really accelerates from 140° to 110°. 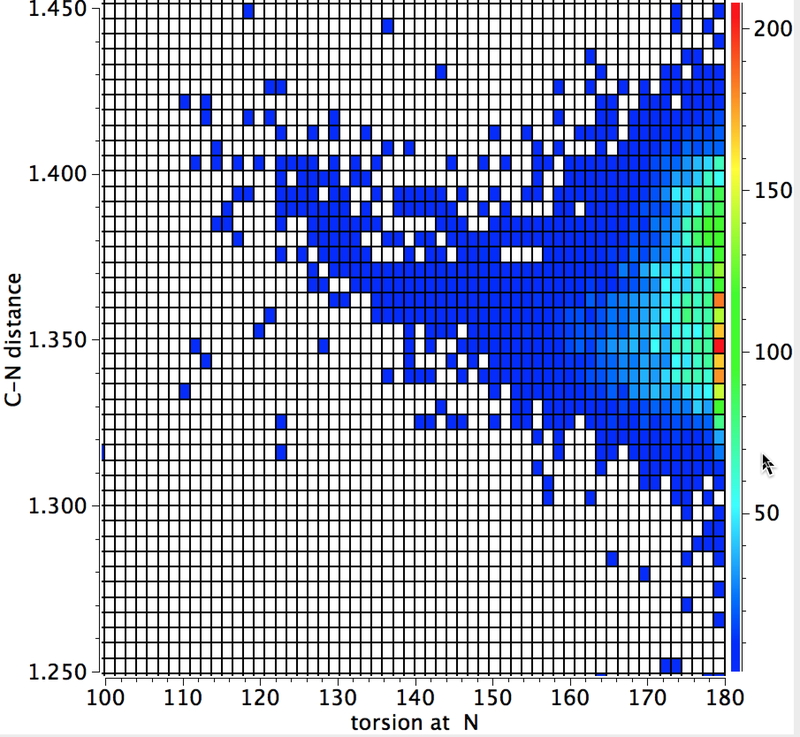 A little twisting hardly affects the π-π overlap, but it really starts to matter for twists of >50°. 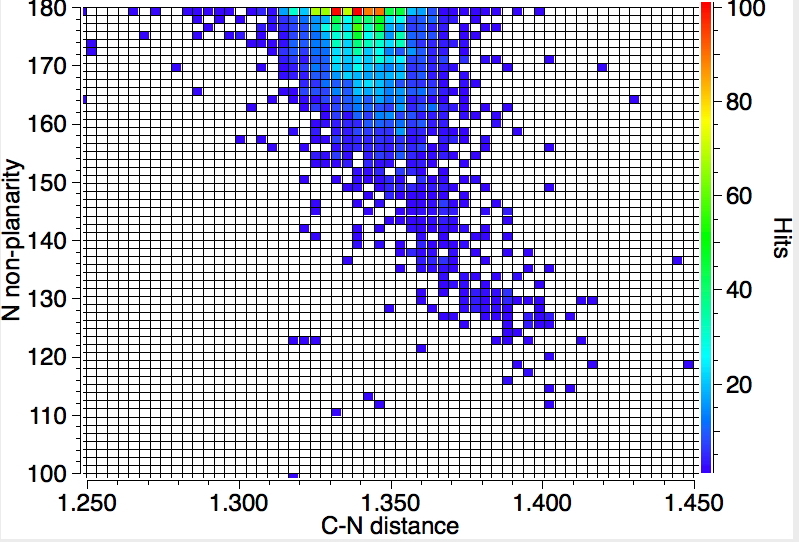 Finally a plot of the C-N vs the C-O distances. As the C-N increases, the C-O contracts, this being a nice summary of the π resonance in amides. 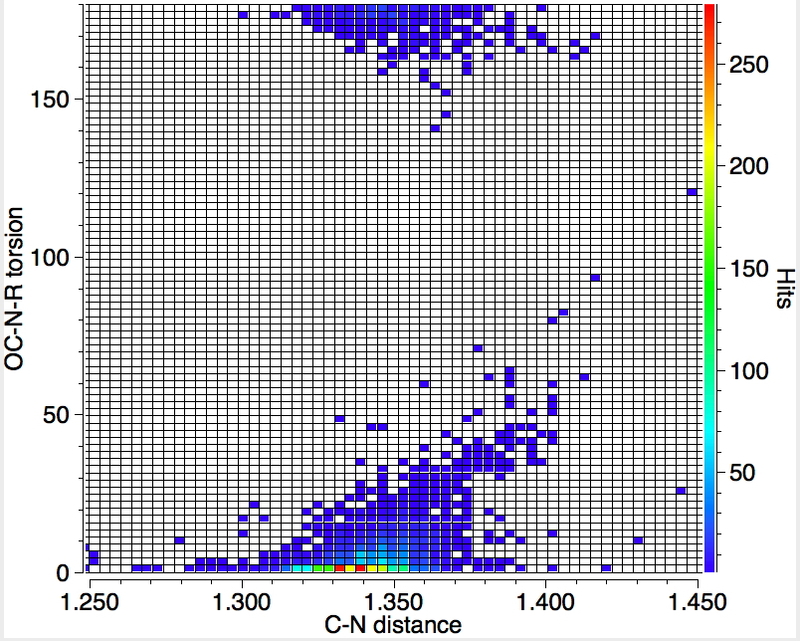 We have not seen any surprises, but this statistical exploration of crystal structures at least puts some numbers on the changes in bond lengths as a result of conjugative resonance. This entry was posted on Saturday, September 5th, 2015 at 9:32 am and is filed under Chemical IT, crystal_structure_mining. You can follow any responses to this entry through the RSS 2.0 feed. You can leave a response, or trackback from your own site. Here is a comparison of the crystallographic trends with an ωB97XD/6-311G(2df) calculation (doi: 10.14469/ch/191487) on MeCONMe2. They match up reasonably well (given the likely wide structure variation/departure from MeCONMe2).